This year for St Andrew’s Day, Andrew house set out to mark the day. In the run up to the day, tartan ribbons and badges were made and sold, and Saltires were put up on display around the school. On the 29th, celebrations took place, seeing a mass in the theatre for all Andrew house celebrated by our chaplain Father Morton, followed by a coffee morning for staff to celebrate our country’s patron saint day. Mrs Connor, Andrew House guidance teacher, tells us about the preparations, and the day itself. Hello! How important is it for the school, and more importantly Andrew house to celebrate St Andrew’s day each year? I think it’s really important in giving us a sense of identity, especially in a Catholic school. As our country’s patron and in particular our house patron, he sets a very good example for our pupils, as in his life, he followed Jesus, something to be encouraged in our school community. Was there any prior fundraising for charities carried out before the day itself? Yes, we sold tartan ribbons and badges to raise funds for St Andrew’s Hospice, and also so we could see pupils walking about the school with them on, on the actual day. There was a mass celebrated, and all of Andrew house attended, do you think it’s good for the pupils to gather together like so? I think it’s a very good idea, it again helps us see our Catholic identity, but it’s also a celebration. The mass was very themed for the day, Father Morton had chosen readings about St Andrew, and spoke about his life, which was very good, because I learned new things about him during the mass. It was really good, as like I said he is a good example as a person for our pupils to try and be like. A coffee morning also took place, did many teachers come along to celebrate and support this, and were there any pupils involved? Most of the teachers came along, it was really good. We involved every year group in preparing for the day, like the first years helped make the tartan bows that we sold around the school, a group of fifth year girls helped out on the day, Michael played the bagpipes and our house captains Robyn and Paul did the vote of thanks at the end. The Andrew pupil council also had a lot to do with it. Was the work done by pupils voluntary, or was it going towards any qualifications? No, it was all voluntary. Was there anything done differently from previous years? Well, we hadn’t had a mass in a few years, so that was different, and we were snowed off last year! Is there anyone you’d like to particularly thank? Yes, Isabel Evans, she did a lot for us, baking, and Tunnocks, I had written to them and they gave us a donation, which was brilliant. Hopefully next year will be just as successful! However, staff will be available at OLHS on Thursday 4th August from 1pm-3pm for anyone wanting to change their Upper School subject choices for 2011-12. Changes to subject levels will be discussed at a later date. Please note that Knowetop Avenue will be closed at Firpark for the International Children’s Games. Access to Dalzell Drive will only be available via Windmillhill Street. “Why are you leaving Our Lady’s High?” seemed the obvious question (or in our case interrogation) to start with. I am leaving for two reasons; one, I am having a baby and two, I have been offered a fulltime job in a high school in Cumbernauld. Fair enough, those reasons are good enough for us. Roll on to the next question! How long have you worked here at Our Lady’s High? Have you enjoyed working here at Our Lady’s High? I have loved working at Our Lady’s High. Yeah yeah Miss, that’s what they all say… 😉 What’s your best memory of Our Lady’s High? One of my first lessons here, a girl came up to me after the lesson and said, “Thank you very much for the great lesson, Miss”. Yes, but I wanted to be a PE teacher. I am glad I am a Maths teacher though. Great, my two favourite subjects, pe and maths. -_- What are your plans after leaving? Having my baby and going to a new job. What will you miss the most (if anything)? Pupils, staff and the purple blazers, I think they’re fab! Nicest uniform in my opinion. Mrs Mulholland. She has Our Lady’s flowing through her veins! So apparently Mrs Mulholland has purple blood. Who would have ever known? Would you come back if you had the chance? We wish Mrs McGuigan all the best of luck for the future. We sent some ace reporters to interview Mr Ardery, who leaves us at the end of term for pastures new. Why are you leaving Our Lady’s High? Another teacher is coming here, so I have to move on. Have you enjoyed working here at OLHS? Yes, it’s been absolutely fantastic! What’s your best memory of Our Lady’s High? No! I always wanted to do something in the countryside like Gamekeeping! What are your plans after leaving? To continue teaching! At Our Lady’s High in Cumbernauld. Ensure that you like children, and remember that you don’t just teach the children – they teach you. Too many! Everyone had an attribute! I’d like to thank all the staff for their help and comradeship and most of all the pupils! Why are leaving Our Lady’s High? Different post – at St.Marys I will be full time. Only 2 or 3 months. Lots of nice memories of the kids I have worked with. Did you always want to work in a school? No. But I’ve enjoyed it. What are your plans after school? The holidays and working at St.Marys. Having long conversations with the kids I work with and fashion tips (not that I need them lol). Chloe. Seeing her develop has been great. We got the chance to interview Mrs Thompson as she gets ready to retire (again). As she was being interviewed, she was washing dishes in the English base. “Why are you leaving Our Lady’s High?” Rachel asked, the question being the one everyone wants to know. Mrs Thompson answered with, “It’s the end of my contract. And now I am completely retired, finally.” Seems like she’s relieved, eh? “Yes, very much so.” was the answer recieved. “Sadly yes.” Thanks for making the profession sound promising, Miss. When asked what her plans were after leaving, she replied that she would be “taking it easy” and “spending the remainder of the money she has left”. Rachel asked her what she would miss the most when she left. “What advice would you offer to anyone wanting to be a teacher?” Gemma asked. “Who was your favourite person to work with?” All the interviewers asked, excitedly. Mrs Thompson will surely be missed by all her pupils and the English department. Goodbye Miss, enjoy your retirement! Three lucky pupils got the chance to interview Mr Knighton, just before he leaves the school to venture out into the big, wide world. The consequences were hilarious. 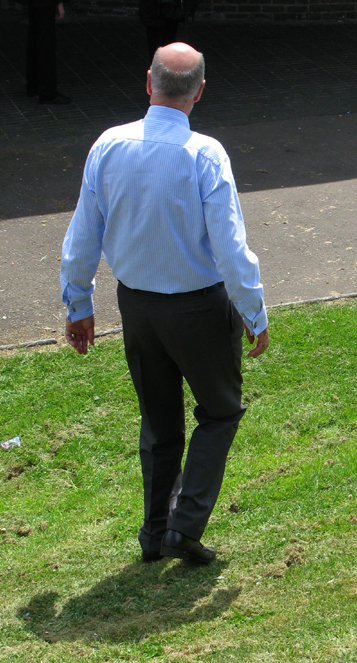 Before the interview, Mr Knighton jokingly pretended to walk away from the “press” in true celebrity fashion. Looks like someone is getting a bit too big for his boots, now he’s leaving us! Gemma then asked if he had always wanted to be a teacher. “No. When I was little I wanted to be an astronaut; the first man on the moon! Hahaha, and I had another dream job but I’ll not mention that,” After some persistence from the journalists, he continued, “I really wanted to be a ninja.” How interesting. “What are your plans after leaving?” Rachel asked, keen to find out. Mr Knighton blabbered on for a little while about the places he’s intending to visit when he leaves. Monte Carlo, Rome and Venice to name a few. Rachel asked next, “Who was your favourite person to work with?” Apparently he loved working with all the staff. It is an “endless list”. Again Rachel asked, “Would you come back if you had the chance?” Mr Knighton laughed and said in a definite voice, “No”. 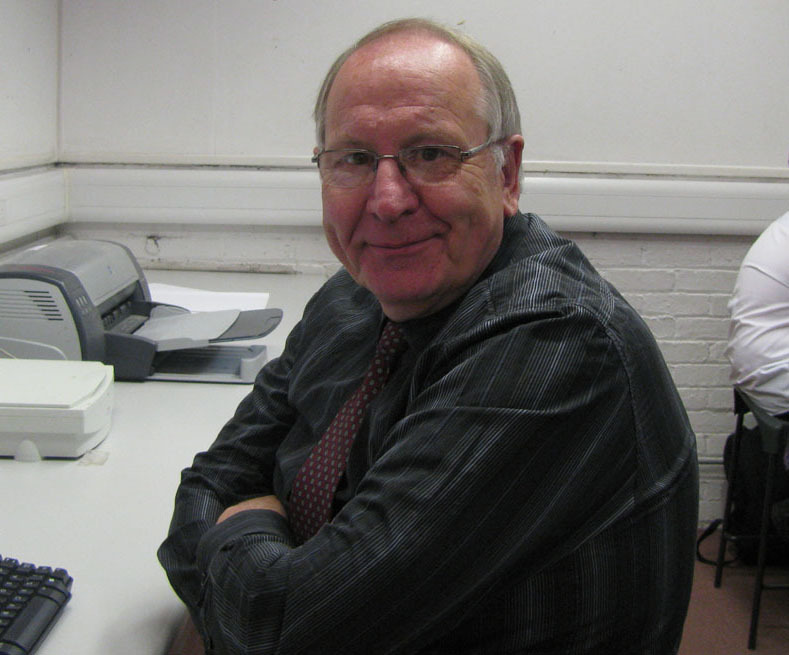 We will all miss Mr Knighton, a beloved member of staff and one of the best teachers this school has had. We all wish him luck in his retirement. Why are you leaving Our Lady’s? Whats your best mempry of Our Lady’s High? Oh my goodness!, that’s a hard one…watching Mrs Fitzpatrick and Mrs Mullholland in the talent show! I am going to travel the world as much as possible. I am a bit scared to go to Africa though! Em….have a sense of humour, treat everybody well, sell your subject and psychology rules! Girls, I dont have any favourite person to work with I’ve enjoyed it too much! Probably not, I think once you go, you have to go. Our Lady’s High is a great school to teach in! Long live Our Lady’s High! Not long. I came to this wonderful school in the cold month of January. Its feels just like yesterday I was walking in the gates of Our Lady’s for the 1st time. Whats been your best memory of Our Lady’s High? Looking for a job as good as the one I have just left now. I will miss staff and pupils. Our Lady’s is a beautiful school with a lovely view I will miss that too. How long have you been at Our Lady’s? I started in August 2009 – so about 18 months. I have enjoyed every last minute. My 3rd year drama class on stage, performing ‘Romeo and Juliet’ in front of 400 people. No. Quite the opposite. I left school claiming to never set foot in a school again. How I ate my words. What are your plans after leaving OLHS? There’s not a minute to catch my breath before starting my new job. You’ve got to love working with young people and truly believe that education is one of the most powerful parts of our lives and can change lives for the better. I worked with so many brilliant colleagues it is impossible to single one out. Thank you to Our Lady’s staff and pupils for making my time here so special. I will never forget the wonderful time I have had here. I only had a 1 year contract here ad need to move on to a new school now. 1 year – but I was also here for six months as a student teacher in 2007. Have you enjoyed working here at OLHS ? I have enjoyed my time immensely, Our Lady’s High is a special school. 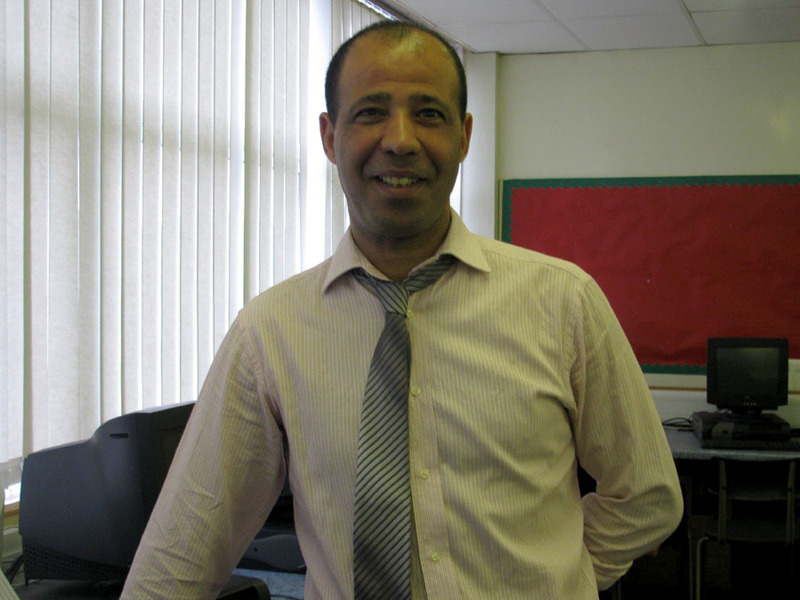 The staff have always made me feel very welcome and I think the pupils are fantastic. The best. What’s your best memory of OLHS ? I have lots of great times. Alton Towers was fab and I really enjoyed taking all the S2 pupils on retreat in May, but my very best memory has to be beating Mr Law in the pool tournament. Did you always want to work in a school ? No, I wanted to be a famous pop star, but I didn’t want to show up everyone in the music industry with my fabulous singing. What are your plans after leaving OLHS ? Party hard all summer then head to St Roch’s Secondary in Glasgow and help give them a fab R.E. department. What will you miss most ? What advice would you offer to anyone wanting to work in a school ? Make sure you’re familiar with your local Job Centre. Who was your favourite person to work with ? Would you come back to the school if you had the chance ? Cheerio – love you all. Hopefully I’ll be back again one day! And I wish all the pupils all the very best for the future – you are a unique bunch! I would like to move on to do new things. I’ve been teaching long enough. Absolutely! It’s a terrific school. Did you always want to be a teacher ? No – I wanted to be a lorry driver. Travel around the world – Eastern Europe, relax and learn to play the guitar. And do whatever my wife tells me. We hope Mr Crossan has enjoyed his time here at Our Lady’s High and farewell ! The department has been given less hours for staff to work so they don’t know what will happen. I have loved it, I really enjoyed it. Lots of things mostly working with all the children. Yes I love working with children. Hopefully get to go to another school or come back to this school. I would miss the children most. The staff in the Learning Support Base they are great to work with. Hopefully I will see you after the holidays. Interview by Melissa and Daniel. Q1) Why are you leaving? A1)I’m not needed here anymore. Q2) How long have you been at OLHS? A2) Less than 1 Year. Q3) Have you enjoyed working here? Q4) What’s your best memory of OLHS ? A4) Too many but the one that I liked best was playing football with the staff. Q5) Did you always want to be a teacher? Q6) What are your plans after leaving OLHS? Q7) What will you miss most? A7) I will miss second year. Q8) What advice would you offer to anyone wanting to be a teacher? A8) Be patient and enjoy it. Q9) Who was your faourite person to work with? Q10) Would you come back to the school if you had the chance? New 5th year pupils learned how not to act in an interview, thanks to the English department. Principal Teacher, Mrs Millar, took the part of a gum-chewing, untidy, rude job applicant while the rest of the department took the role of the interview panel. Pupils were asked to spot all the reasons why she wouldn’t be offered the job, before drawing up their own lists for more successful interviews.